Natural coastal defenses, such as mangroves, dunes, and vegetative buffers can be cost-effective, self-maintaining, and adaptable methods to help protect our Town from hurricanes and floods. Natural coastal defenses also provide critical habitat and water quality protection. Mangroves can reduce storm surge by slowing the flow of water and reducing surface waves. Dunes protect beaches from erosion and help to lessen flooding during coastal storms. The State’s Coastal Construction Control Line (CCCL) program protects beaches and dunes from construction that could weaken, damage, or destroy the integrity of beach and dune systems that help protect against flooding. Mangroves provide many valuable services: they stabilize shorelines by reducing wave energy and erosion, filter pollutants from water, pull carbon from the atmosphere, and provide nursery grounds and habitat for a wide range of wildlife and estuarine creatures, including commercial and recreational fish species. Although, the State of Florida, Pinellas County, and the Town of Redington Shores regulate the cutting of mangroves, they can be trimmed to provide a view, and will still help reduce damage to waterfront property and sea walls. Mangroves are protected by the State’s “Mangrove Trimming and Preservation Act” and the enforcement of this statute has been delegated to Pinellas County. The Pinellas County Commission subsequently adopted a Countywide ordinance regulating the trimming of mangroves. Staff biologists and arborists work closely with homeowners and trimmers to protect the important functions of these plant communities and to ensure that all trimming is consistent with the Pinellas County Municode Chapter 166 / Division 3 – Mangrove Trimming and Preservation Code. 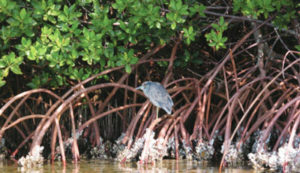 To trim mangroves in Pinellas County, you must either qualify for one of the exemptions in the code or obtain a permit. Please call (727) 453-3385 for any questions. Beaches and dunes provide a natural buffer from storm events, and serve as critical habitat for wildlife and plants. The beach and dune system is our first line of defense against storms because it acts as a buffer between the storm waves and coastal development. During tropical storm events, waves run into the beach and dunes before crashing into upland structures. When this happens, the sand making up the beach and dune system absorb energy and reduce damage to structures. The coastal sandy beach system is home to several species of plants and animals that are dependent upon the beaches, dunes and near shore waters for all or part of their lives. For example, beaches are used by resident and migratory shorebirds for resting, foraging and nesting and during the summer months, marine turtles come ashore to nest on the beach. Do not walk on sand dunes or disturb vegetation; they protect beaches from erosion and help to lessen flooding during coastal storms. Plants help to build up the dunes and maintain their form, so that in major storms, the dunes will act as a buffer against waves and flooding. Sea oats are extremely valuable plants for coast line and barrier island protection. They help stabilize the sand dunes and prevent erosion; especially during extreme weather events, such as hurricanes and tropical storms.. They also catch blowing sand and help build dunes. Their addition to the coastal ecosystem also provides food and shelter to wildlife. 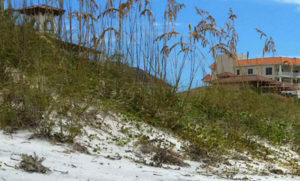 Sea Oats are protected by State Law. Picking them is against the law and violating it carries a hefty fine. The Town of Redington Shores participates in and supports Pinellas County’s annual efforts of planting additional sea oats by partnering with the County in the Sea Oat Planting Program. Sea grape trees and shrubs act as a continuous sand trap, which plays a major role in the construction of the beach and dune system. 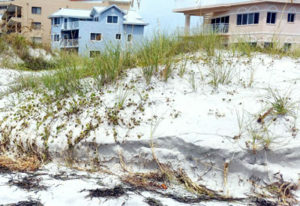 Without the stabilizing and accreting effects of Sea grapes and other salt-tolerant plant species, the beach and dune system becomes more vulnerable to erosion. Sea grape berries are also a source of food for a number of native birds and mammals. Marine turtle nesting and hatching occurs each year from May 1st through October 31st. Female turtles come ashore in the dark, dig a hole using their flippers, and lay eggs. After a 45 to 70 day gestation period, hatchlings emerge from the nest at night and follow the moonlight reflecting off the Gulf. Turn Lights Out. Bright lights disorient hatchlings by attracting them inland where they often die of dehydration, predation, or are run over by vehicles. Turn out unnecessary beach lights to help prevent disorientation of female sea turtles and hatchlings. Close your curtains and be mindful of bright lights shining on the beach. Knock down sand castles and fill in sand pits. This helps to eliminate the challenges the baby hatchlings must cross on their way to the shoreline. Sand pits can be like the Grand Canyon and sand castles like Mount Everest to tiny baby sea turtles. Pick up after yourself when you leave the beach. Chairs, tents, and coolers are obstacles for the sea turtles. Anything left on the beach between one hour after sunset and 8:00 AM will be removed and disposed of. 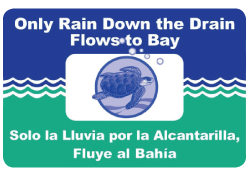 Plant a buffer area of native plants between maintained areas of the property and the street or shore to help reduce wave run-up caused by vehicle wake on flooded streets or from the intercostal. A buffer will also filter sediments and pollutants and beautify the area. Excess nutrients (from pet wastes or fertilizers) and sediments that wash into coastal waters can reduce water quality and lead to nuisance algae growth. Plants offer a natural defense—capturing and filtering many of these pollutants before they reach coastal waters. Pet wastes, oil and other materials that get into stormdrains flow directly into the intracoastal waterway. It is illegal to dump anything into any stormdrain or waterway. It is also illegal to leave your pet’s waste on the ground. The town of Redington Shores enforces these rules and violators are fined. There are numerous Stormwater inlets on public and private properties in town. The Public Works Department inspects these inlets on a biannual basis to determine if they are being maintained. If you see anyone dumping trash, lawn clippings, etc. into these inlets, contact the building department. If seen at night or weekends contact the police department at (727) 595-5414.